A member of the tri club, I’ve done a few sprint tris. I don’t swim at all well, I’m not much of a cyclist and, whilst I run, I’ve not much speed although I do seem to be able to just keep going. So it came as a complete surprise to receive a Special Award for single discipline performance at the recent AGM, for the ultras I ran last year. Jane suggested some of you might be interested in a bit of a blog about my adventures so I thought I’d share some of my thoughts as I’m working towards this year’s big one. On 12th May I’ll be on the beach in St Bees for the start of the 2018 Northern Traverse. Organised by Open Adventure, it’s a continuous endurance race along Wainwright’s coast to coast route to Robin Hood’s Bay. 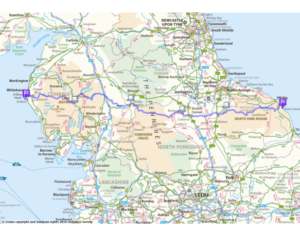 From the Irish Sea to the North Sea, 190 miles across 3 national parks, the Lake District fells, Yorkshire Dales and (bleak) North York Moors. The organisers provide four feed stations along the route, where we have access to a drop bag, but apart from that, participants must be fully self supported, self-navigating and receiving no external help other than buying supplies from a shop or pub which is available to all participants. We have five days to complete the event with generous cut offs at each feed station. We must not stray more than 200m from the prescribed route without returning to the point at which we left it. Time penalties or disqualification may result should we do so. In this case, I participated in the NT in 2016 so I have the advantage of having done it before……..but that’s also the disadvantage of knowing what I’m letting myself in for. I have a view that ultrarunners share some form of amnesia which effectively blocks out the excruciating pain of running mile after mile on rough ground with blisters on all toes and a liberal application of Compeed plasters in various states of disarray decorating the feet. 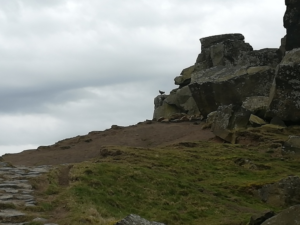 I can vaguely recall tears and despair around mile 150 when my legs wouldn’t obey a request to climb another hill on the Cleveland Way. I remember experiencing a complete loss of appetite and the endless struggle to force fluid down. Then there were surreal moments when complete strangers seemed to pop out of bushes and other ‘hiding’ places, as I saw it, addressing me by name and saying I was doing well. How did they know who I was and where to find me? Well, we all carry trackers so folks can follow our progress – Flojo popped up twice – nothing like being stalked! And, after finishing, my legs and feet became so swollen that my ankles disappeared as the body’s natural response to such significant trauma, acute inflammation, kicked in, in a major way to repair the damage. So, why then, am I attempting it again? I’m two years older and, now in my 60th year, shouldn’t I be taking life easier? – ask well-meaning non-running friends, with startled expressions and slow head shaking. “Bonkers” – such an overused word – but describes something that is outwith the user’s ability to imagine. I just smile. Well, would you want to taste a fine wine or enjoy a stunning sunset only once? Each time is a bit different but equally enjoyable. Pushing myself to my physical and mental limits and succeeding delivers the same sense of inner contentment. Does having prior knowledge help me to prepare? Well, yes it must do. However, I only discovered fell running six years ago and attempted my first ultra in 2013. I then fractured an ankle and foot and lost the next year to rehab. It’s been a steep learning curve – no pun intended. I’m approaching this race as if it is the first time I’ve done it. That way I hope not to be complacent about any aspect. I start by considering what I can control and what I can’t. Training started late, at the beginning of February. My basic approach is twofold: a) what are my strengths and weaknesses for this event and b) what things are most specific and least specific. I then spend the early weeks working on my weaknesses and the non-specific aspects and transition to my strengths and race-specific aspects closer to the event date. Weaknesses abound but, in particular, I need to work on hills and speed so this is how I’ve spent February and March. It’s been challenging with the cold and so much snow but high-stepping through deep snow drifts and keeping traction on icy surfaces has provided a whole-body workout and probably helped a bit with stamina. My strength is the ability to keep going, so I leave endurance to the weeks closer to the race. Specific to the race is the route and my nutrition plan and kit. Now into April, I’ve been out doing some long days, recceing the route and testing my nutrition and kit. Clearly, it’s a bit more involved that this but I have evolved the basic structure over the few years I’ve been doing this and found it seems to have merit for me. 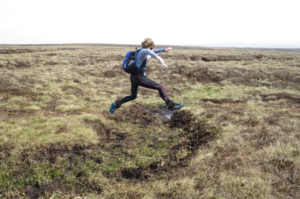 You can’t cater for everything you’ll encounter; the bogs, swamps, sore feet and fatigue you can anticipate. 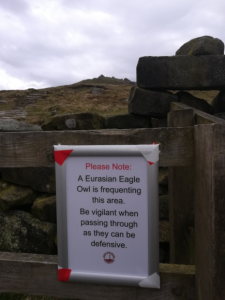 However on a recce last week I could not have anticipated an attack by an eagle owl whilst on the Cleveland Way. When something with a four-foot wingspan is coming at you through the air, it produces some adrenaline-fuelled erratic speed work that I could well have done without! I’ll post the tracker detail on the FB page once it’s known so you can follow my (slow) progress should you wish to do so. ← Apples have cores, not cyclists!